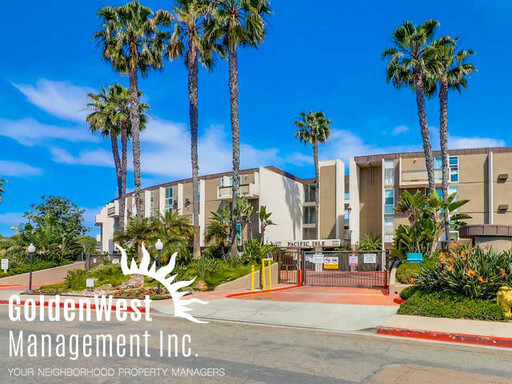 Highly sought after Pacific Isle 2Bdm 1Ba condo minutes from Point Loma beaches. Enjoy the complex's tropical oasis style with noteworthy pool, hot tub & club house areas. Located in a gated community, this turnkey second floor unit is light and bright with spacious floor plan and new carpet throughout. The kitchen features an island with breakfast bar, all appliances and plenty of cabinet space. Living room opens into a huge patio perfect for relaxing or entertaining. Two large bedrooms including mirrored closet doors and A/C. Bathroom has separate vanity and shower area. Two assigned covered parking spaces. Enjoy the summer breeze with friends or family in this perfect location. Closet shops, parks and beaches. Small pets with approval; Water, Trash & Sewer included.